Once upon a time, there was a little girl who loved books. She loved them so much she practically gobbled up each one she held in her hands. Her Mama took her to the library, and she still remembers signing for her first library card. She would choose a half-dozen or more books and bring them home, laying them all out open to the blurb–which she had already read before selecting each one–and reread each summary. Sitting there on the gold carpet in the open doorway to her bedroom, she’d make the difficult choice of which one to read first. It was only natural that she work in a library, I suppose, which she did. The same one where she got her first card–she worked there all through high school. Books helped pay her way through college, I guess you could say. The girl loved the smell of books and the feel of them and the way they lined up so neatly, alphabetized by author or organized according to the Dewey decimal system. A world where everything made sense and words were magical, bringing stories and people and worlds to life. The little girl, who wasn’t so little anymore, had always loved writing stories. And she dreamed big. She hoped that one day, maybe just maybe, crossing her fingers for luck and wishing on every star–that one day her name could be on the cover of a book. And being the girl who always (umm, well, no)–mostly tried to do what her Mama said, she sat down that very day to write the stories in her heart. The ones that made her laugh, the ones from growing up, and the ones that made her cry. All of them. And with the encouragement and love of her dear friends and family, she kept on writing. Then one day her Fairy Godmother came along sharing delicious fried bologna sandwiches and said, “There will be a book published, filled with Christmas stories. You should think about writing something and send it along to see what will happen.” And with a wink and nod and a promise to come back when it was spring planting time, she left, reminding the girl to be mindful of the deadline. After the clock struck twelve, all chances would be lost. So the girl went to see the Queen, who was gathering the stories, and she was welcomed in and encouraged. The girl knew just what story to share. On an afternoon filled with light, sitting in her Nest, looking out at the birds and the trees, the girl wrote her story. As she typed the last words, her heart was full. Oh, the precious memories attached to one little 4 by 6 card! Delicious ones too–her heart was light because her spirit was filled with the joy of sharing a sweet memory. Before the clock struck twelve, the girl hit “attach” and “send,” and all was good. The kind Queen nodded and said yes! And now, the girl awaits the clock striking midnight on December 1. For on December 2, the book will be available for all to read. 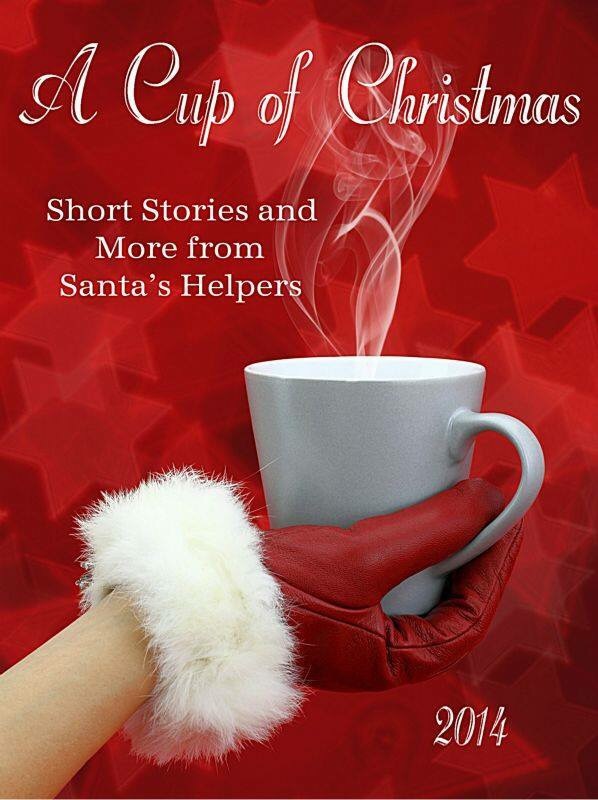 Stories, poems, and recipes from 31 different writers all together in a cozy read–“A Cup of Christmas.” It is an e-book, easily sent to wish all a merry Christmas and happy holiday season. And it’s the beginning of the girl’s dreams coming true! 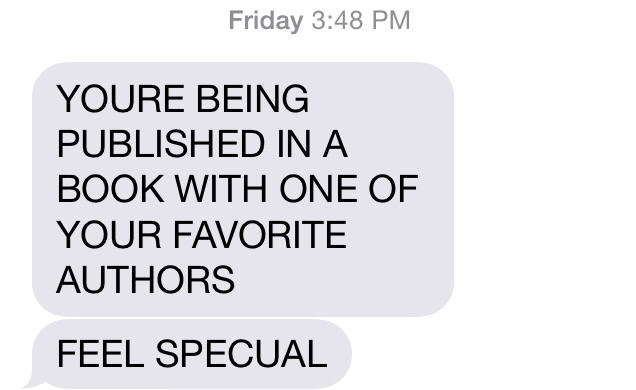 My text from my college girl after she found out that Renea Winchester has a story in the book too. Note the ALL CAPS–she’s yelling with excitement! I feel loved. And yes, special. “First Book is determined to see that all children, regardless of their economic conditions, can achieve more in school and in life through access to an ongoing supply of new books. With the help of our partners, donors and dedicated volunteers we have provided more than 120 million new books to schools and programs serving children in need. Yet millions of children are still waiting for our help. I just know my Mama is smiling right now, as children and books and children’s books were her most favorite things in the whole wide world. Maybe THIS is why she told me to start writing my stories. Thank you all for reading and sharing my stories. It would mean a lot if you could make the time to read one more–the one in “A Cup of Christmas,” along with all the other wonderful stories and poems. I can’t wait to read them all myself. A hint about my story. 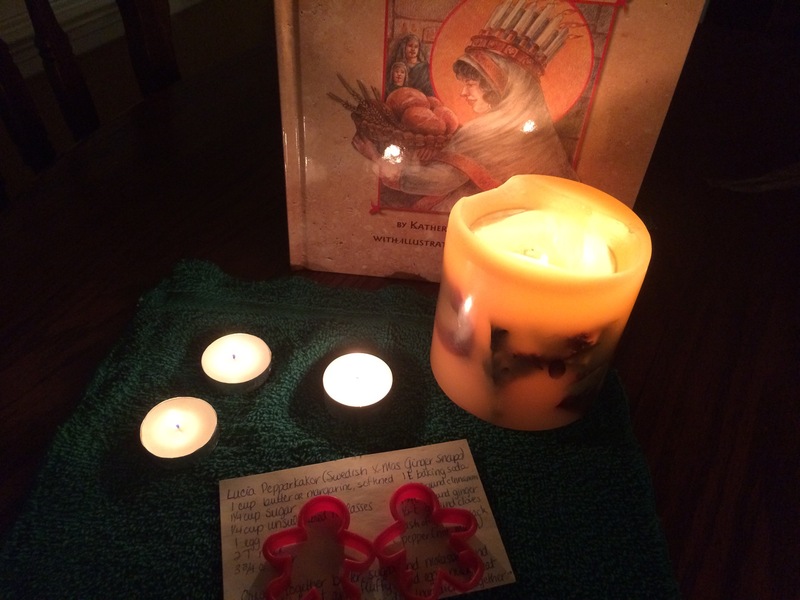 Candles, cookie cutters, a special recipe, and a girl who shared light and love long, long ago…..
Hallmark Channel has been showing Christmas movies for weeks, and I actually heard Christmas music on the radio two weeks ago. It’s just that now I can enjoy it all guilt free. I used to be one of those who would not listen to a single Christmas carol before Thanksgiving Day was over, but I have to admit that last year and this, I’ve snuck in some listening a little earlier. I’ve needed what the music does for my soul. And now, I can listen without shame. Without hiding. Without worrying that the littles were going to throw me under the bus about what I’d been listening to. We have a gentleman who lives about a mile from here who decorates his yard elaborately every year. Except for last Christmas. Big trees had fallen on his home after a tremendous rainstorm, so while he was rebuilding, no lights. But this year, road construction going on in front of his house and all–he’s got them out. And he started lighting them up at night a week or so ago. I am so happy to see those lights again. They were missed last year. I love it. And I love that I can see their lights from where I’m sitting near the fireplace right now. But turns out, we have decorated for the season. And it was no trouble at all. 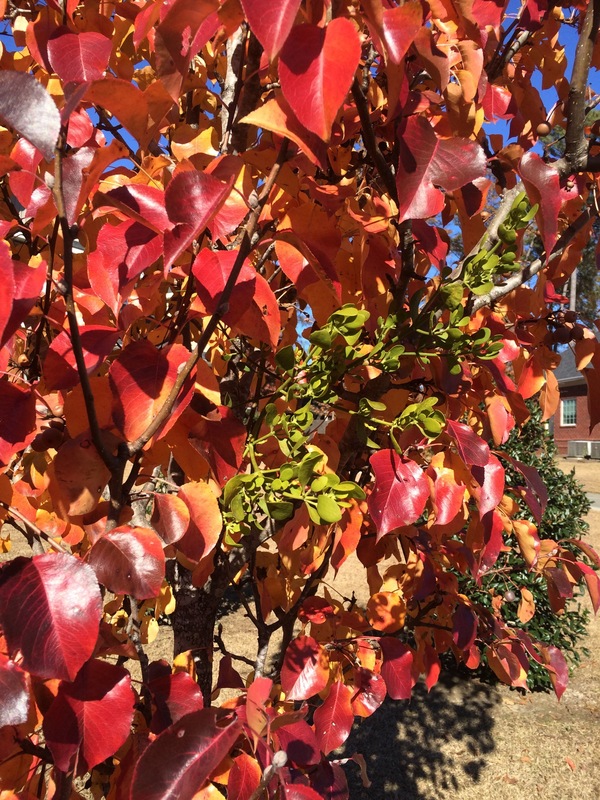 The mistletoe peeking out from the beautiful fall foliage of my Bradford Pear. I first noticed this growing on/in my Bradford Pear tree a couple of months ago. When everything was green, it was hard to completely decide that one of these things was not like the other, but I had my suspicions. And sure enough, now that the tree that I chose because of its beautiful, flaming, fall foliage is in full “bloom,” I know exactly what that is. I remember stories of folks going out in the woods and shooting down mistletoe to bring back and hang in their homes. I am delighted–downright tickled–that my front yard can boast such an old-fashioned Christmas decoration! It is interesting to read about mistletoe. Turns out that clump was probably started over a year ago, from just a tiny little seed left there by a bird who likely ate a mistletoe berry from somewhere else. It is slow growing and has to function on its own for a bit until it can really root into its host tree and then it grows right there with the tree. All concerns about whether this is harming my Bradford Pear aside, this plant that is growing as though it was always a part of the original tree all along got me to thinking. It’s hard during dark times and times of loss and pain to have either of those. And yet, one day someone comes along and smiles or offers directions or compliments you on your shirt, and suddenly you are stepping a little lighter, if only for a moment. And then later on, it takes root, down deep in your heart and soul and it becomes an integral part of your being. Your way of life. Hope, spirit, love, light–it’s a part of your very being. And it stands out just as much as that mistletoe does on my beautiful Bradford Pear. As we go about our days, may we never miss a moment to drop a seed that could help grow someone’s hope and Christmas spirit. For it is through those small kindnesses that we can light up the whole world, not just during the holiday season, but everyday. quite frankly we love her. Already she is changing things around here. She bustles around in her long skirt that hangs just so; she is straightening up, seeing to it that all are getting along. She is bringing things, people together in such a way that has never been seen around here before. Have I mentioned we love her? All these things that just sat, on their own, not interacting or doing much of anything, are now up, wandering about, mixing, mingling–making the world a much better place with their interactions. Thank you for sending her to us. Because, you see, just as those things were sitting on the shelf, all to themselves–not being with, we have begun to do that ourselves. Sitting with those who are alike, where there is no need for sharing or caring or what not–because we are, well, just alike. But now that she is here, she is challenging us to join together–what a scary, challenging, beautiful word–together. She knows–she understands–that she cannot stand alone, she must coexist with another. With more than one actually. She wants to show us that being together is the best way for each one of us to shine. She wants to take all those adjectives, then put them together. Just by taking the hand of each one–then standing between them. If we are not careful, her spirit might just catch on–one day we might just find her joining the two who said they’d never stand together. Bless her. She’s got a long way to go, but one day, maybe, just maybe, she might succeed in helping us all take the hand of the one standing close by, and then caring and sharing and helping each other. Thank you for sending her. This morning the crew and I watched the Macy’s Thanksgiving Day parade. As I finished prepping the food to take to Blackberry Flats where we would join Mess Cat, Leroy, Shaker, and some of Leroy’s family for dinner, I was able to watch the parade off and on, listening always. Favorite performances found me pausing in my prep, with a dishtowel in my hands and a little flour on my “Gobble ’til you wobble” shirt. Those are some seriously strong women. I never cease to be amazed by their skill and synchronization. And the musical performances–we really enjoy hearing the artists we know. The bands, the floats, those balloons (I’m looking at you Snoopy), they all set the stage for fun and excitement and anticipation. Since we read Melissa Sweet’s book Balloons Over Broadway about Tony Sarg, the puppeteer who was tapped by Macy’s to put together the first parade in 1924 to lift the spirits of the folks who were missing the traditions of their homeland, the whole story has been on my heart. I watched with new eyes today. The joie de vivre, the spirit of the crowd–it was infectious. And in my mind’s eye, I saw the people of the first few parades, mapping out what would become a part of our story. All of us together. Watching or walking or celebrating. Together. The book about Sarah Hale writing politicians and Presidents for 38 years in the effort to make Thanksgiving Day a national holiday has been on my mind too. President Lincoln was the President who finally said yes, we need this, all of us together, and the holiday came into being. A sharing of all that is in each of us. To make something entirely new. Doggone that Macy’s parade. Making me sloppy cry so early in the day. Tonight I’m thankful for plentiful bounty. Food, family, love, home. I’m thankful that for the first time in six years family gathered together for this day in the kitchen of the house where we grew up, and once again, it was filled with laughter and the sounds of folks filling their bodies and souls with nourishment. And I’m thankful for the sweet voice of one aged and wise, “That was the best meal I’ve ever eaten, and I’m not kidding.” Bless her. That made every. single. minute. on my feet and cooking absolutely worthwhile. For the chance to wash dishes looking out the same kitchen window as I did all those years, I give thanks. What once was a chore has become a privilege. As I rinsed the plates, I thought about how Mama would say she loved to wash the dishes because the hot water eased the discomfort from the arthritis in her hands. From that window, I watched the children playing outside, making memories where we who are supposedly grown once played. Today was a little like it used to be, a little like it should be, and a little something entirely new. In the end, I think the best stories our children will share will be how folks who were different and who carried with them different traditions and beliefs and raisings came together. They will tell how folks built something from the old ways, something from the new ways, and made something brand new and entirely different and filled with love and respect. And I think that is truly something to give thanks for. Today at the sink in that rare quiet moment, this song started playing in my head. Not a Christmas or Thanksgiving song, but a living life song. “I Won’t Give Up” written by Jason Mraz and Michael Natter. The words sing to me a love song about loving each other and not giving up for any reason, even if, especially if, we’re so very different. And God knowing we’re worth it. Yes. I’m not giving up on this world or the people in it. God knows we’re worth it. We can do this. Come together as a people, whole again, still honoring our stories and traditions from the past while respecting where we are now. Together. I won’t give up on us. I’m still looking up. And out a window. Old. And New. Together. Today has been a busy one. And I wish my poor Mama were here so very much right now. Besides the obvious reasons, there’s this. All those years she put a veritable feast on the table, and all we could do is eat it. In such a small fraction of the time it took for her to prepare it. And then we children would work out the details about who was cleaning up what–I’m using “work out” as a euphemism here. She could cook circles around me, as my children often lovingly *ahem* remind me. Still, I know she was worn out from all the Thanksgiving dinner preparations. Today I’ve only done about half of what she did, and I am one whooped puppy. So tonight I’m calling it a night with a tired body reminding me how old I am and a mind already ticking off what needs to be done when I get up in the morning. I am thankful. For a body that can still do and a mind that can still plan. I am thankful for the bounty of groceries that I have gone through today and yet, there’s still plenty more to cook from the next day and the next and the day after that. I am grateful for the sanitation folks who picked up our trash this morning and will pick up from all this from my meal preparations next week. I am thankful for the farmers and the growers and the folks who packaged and shipped and transported and shelved and sold me these groceries. I appreciate the laughter of my children today while I was cooking and prepping and trying to figure out if I could find one more baking dish….. Tomorrow we will celebrate and give thanks together once again at Blackberry Flats–our homeplace for right at 37 years now. It’s been several years since we gathered together around Mama’s good cooking, and tomorrow, while she and Daddy and all those who have gone on up to the House will be missed–it will be a celebration of what is good and right to be back “home” eating Thanksgiving dinner. The littles will climb trees and pet kittens and play good guys and bad guys or Star Wars or something like that, while all of us grownups will either watch football or try to figure out if anyone will notice if we close our eyes for just a minute…..or both. Tonight I am thankful for so many things, and one big one is you. Thank you for stopping in and reading my stories. Whether this is the first time or the 622nd time, thank you. When you read what flows from my heart and soul through my fingers to this keyboard and screen, you bring them to life. And I thank you for that. A story wants to be heard. Thank you for listening. Most of all, I am thankful that, as I picked up one of the potholders my Daddy made for my Mama years ago and I went over to the oven to peek in on my pies, I heard my Mama’s voice. For these and all our many blessings. Whether it’s original or not, I will always think of these as her words. It was her prayer and how she lived her life. No matter what happened, she always looked for something to be thankful for. Is it any wonder that, despite all the cooking she did, this holiday was one of her favorite days all year? She just wished we’d celebrate and give thanks year round. Thankful to you and for you. I went to the grocery store today. I know. Big mistake. Two days before Thanksgiving. I knew better. Y’all, it was crazier than the grocery store when a half-inch of snow is predicted. They were almost out of EGGS. Seeing as the one request I’ve had is for my deviled eggs, this could have been devastating. I was prepared today. I took a list. And not just the one where I jot down things in my brain that I’d prefer not to forget to get. I wrote it out on a piece of blue paper that I tore off from one of the littles’ papers we were *ahem* letting go of. One side a grocery list. The other side a list of what I’m fixing to take to Mess Cat’s house for our Thanksgiving dinner. It’s a little heavy on the dessert offerings. But they’re my favorite to make, so…..yeah, pie is good. I wish I could say I whisked in and out and was done fast as lightning. It was packed. Very crowded. Like a Saturday morning or the day before a “big” snow. I picked the wrong day to pick out the very biggest cart…..so hard to maneuver. But I got it done, with everything on my list checked off. Except for mini-bagels. My crew was impressed with pizza bagel bites and I thought–well I can make those on my own. Only I was wrong when I thought that, because I couldn’t find mini-bagels, so I decided it wasn’t that serious and headed to the checkout. The fellow directing grocery cart traffic (because that’s a very real thing) sent me to aisle 4. Unfortunately the guy there had only started unloading his cart, and he had quite a bit to purchase. Another clerk walking by told me I could move to aisle 5. I’m sure that it wasn’t because she noticed me stretching my neck to see how long the wait in that one was or because she could tell I was trying to see if I could move and not be violating some grocery cart traffic law. Positive it wasn’t any of those reasons….. The clerk in Aisle 5 was efficient as was the young woman bagging up the groceries. He smiled politely and worked through my pile of purchases quickly. When he handed me my bag with my egg carton on the bottom and a loaf of bread on the top, I thought I might swoon. Seriously, I am convinced that’s why the two are shaped so similarly, with just about the exact same lengths–they are both delicate and should be bagged accordingly. When he did that, I knew he was a dedicated young man. That and the button he wore declaring him associate of the month said it all. I love that name. I looked at his face and how he was putting forth his best efforts, despite the fact that I was only one of the many, many folks who would cross his path this evening. Sincere. Yep. It suited. Oh me. A young man and his Mama. For the love. “Well you hang on to her and love her,” I said as I collected my receipt, said goodbye to the bagger, and began to push my cart away. Huh? Hang on to her and love her? Grief can make us do some wacky things, can’t it? Talk to strangers. And tell them to hang on to their Mamas? What I really wanted to do was weep and give him a hug and money to go buy his Mama a big beautiful bouquet and make him promise to spend a day just listening to her stories and what her dreams and wishes have been and how those have changed over the years and then take lots of pictures, silly and serious, of the two of them and anyone else who would join them. Because there’s no such thing as too much time listening to stories or celebrating relationships or hugging folks you love or pictures. In fact, there’s rarely enough of times like that. It’s all too short. When I got home, once again I was faced with all the pain and brokenness in our world. And it made me sad. Again. Then I stumbled across these words of my sweet friend–my friend who knows about grief and missing Mamas firsthand–and like someone catching you before you fall and hurt yourself, her words caught me and were so full of grace, I felt as though she were telling me what I did today wasn’t goofy. That it was okay. Tonight I’m thankful for the reminder that in the face of darkness, love. Just love on some folks. Even if it’s awkward and sounds like you’re two when you do it. Love. Be kind. An appropriate lesson as we are about to enter the season that’s really all about that, isn’t it? Sending Love and Light into the darkness? And that’ll do for two days before Thanksgiving. As this week moves along and people all over are preparing for Thursday and Thanksgiving in all different kinds of ways, I too am preparing for the day. Grocery list, baking, cooking (they are two very different things, you know), cleaning up, planning the timing around the parade *ahem*, and things like that. But I’m also, just a little, working on preparing my heart. An attitude of gratitude is something my Mama drilled in us. Be thankful. In all things. I think she really liked what that guy Paul in the Good Book said about that. She took him at his word. And wanted us to live it too. As I prepare for Thanksgiving, I am looking towards next Sunday as well. The first Sunday in Advent. To be honest, I didn’t really know much about Advent until maybe twenty-five years ago. And I have continued to learn more and more since that time. I love the rituals, the lighting of the candles on the wreath. The getting ready. The settling of the soul. The quiet meditations and devotions. Each year for the past four, I’ve hoped to start our school year early enough that we can take some time off from our traditional lessons to step outside the box in December and go in another direction. And each year, for whatever reason, that has been torpedoed, and we’ve worked right up through the third week in December. *shhhh* Don’t tell anyone, lest the universe find out and totally mess this up for us, but I think it’s going to happen. I want for us to have time to read Christmas stories, learn about holiday traditions from different cultures, watch Christmas movies, sing songs, make cookies, play, and not have every single day structured. I am very happy that we are heading in that direction. I already have some books picked out to share with my littles. I have a couple of “read every day” books that we will start on Sunday or Monday (it being the first and all). One really sweet one that I’m looking forward to reading with them for the very first time is Advent Storybook by Antonie Schneider, Maja Dusikova, and translated by Marisa Miller. We haven’t read any of it together yet, but as I looked over it today, it touched my heart and made me smile. I think we will all enjoy it. It’s the story of a little bear who wants Christmas to come fast, so his mother agrees to tell him a story each night until then. So there are twenty-four stories about another little bear and his trek to Bethlehem. Very sweet. Embracing the magic of the season, we will again pull out our copy of Letters from Father Christmas by J.R.R. Tolkien. It’s a collection of the letters that were sent to the Tolkien family home over the many years his children were small and home. The stories will make you laugh and want to hear them all over again…..and so we will do just that. I came across the books The Jesse Tree: Daily Readings for Advent and Gobsmacked: Daily Devotions for Advent by Thom M. Shuman a few years ago. These are both beautifully written Advent devotionals that I dearly love. I ordered them as downloads, e-book style, from this website, as hard copies were not available at the time. I love everything Mr. Shuman has ever written. If you haven’t read any of his poetry before, please take the time to do so. Powerful and grace-filled. Beautiful. You can find it here. This time of year can be so wonderful in many ways, but it can also be hard. For many the darkness is not just because the sun is going down a little earlier. Many people struggle with loss and pain and brokenness that doesn’t go away magically, despite the wonder and brightness of the season. It can be very hard when you feel like there’s a party going on all over and you’re the only one who doesn’t feel like going. If any of you are local, you can purchase her book at Bare Bulb Coffee in Kathleen and a portion of the proceeds will go to support hunger missions. If you are not, you can order her book here. It is available as an e-book as well. I also look forward to reading Dena’s latest work, a devotional for the littles, with my crew. I can’t wait to hear their laughter over the antics of Father Christmas and the North Polar Bear. And I just know we will be drawing pictures from the adventures of the little bear on his way to Bethlehem. The story just lends itself to good conversation and good thoughts. I am thankful that, as this season and so much hurries and scurries on by me, I can shut it all off for at least a few minutes everyday, and sit and have coffee with my friend Dena (which I’ve been lucky enough to do in person as well), and with Mr. Thom– quieting my soul in the midst of the chaos and darkness and looking forward to the Light that is coming. And while I love my twinkly lights in my “roost” so much, they are nothing compared to the Light of Love and Peace. That’s what my favorite thing about Christmas is–feeling my heart fill with both of those things. May we all find that to be true–hearts full to bustin’ with love and light and a peace that passes all understanding.